The Croisette offers more than just immaculate beaches, beautiful hotels and glamorous shops. When we walked over to the nearby Port Pierre Canto to catch the boat shuttle to the Sainte-Marguerite island for a celebration lunch, we passed by the 'Jardin de la Roseraie' (Rose garden), where a strikingly beautiful coral flower tree broke the neat line of palm trees, as if a precious bead had been placed in the middle of a string of pearls. 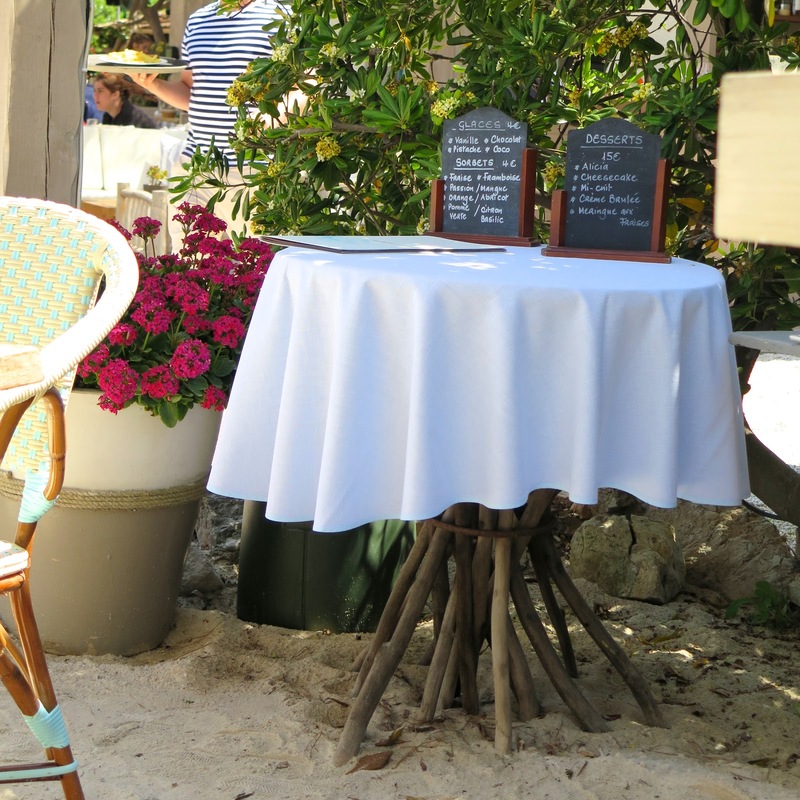 The atmosphere in the 'La Guérite' is relaxed and stylish...Robinson Crusoe chic! The driftwood tables are planted straight into the sand, lounge chairs with striped cushions invite you to relax, and tables are set with crisp white napkins. The staff are friendly and warm, and they make sure that your visit to La Guérite will make a fun and memorable day. 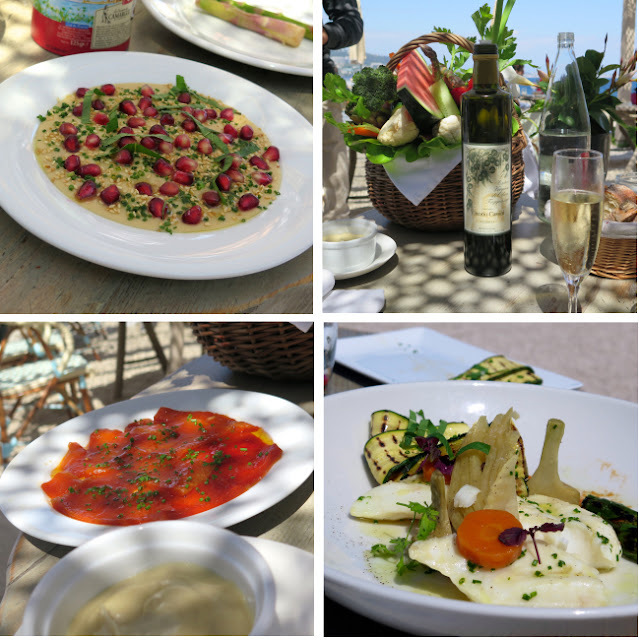 The cuisine is simple fresh Mediterranean, and a bit more expensive than town.. but because of the exceptional setting and atmosphere it is so well worth it. After lunch, you can spend the afternoon on the complimentary sunloungers, while taking in the amazing view over the bay of Cannes and the Golf of Juan. This is another tunic which has been a great summer wardrobe staple for years. 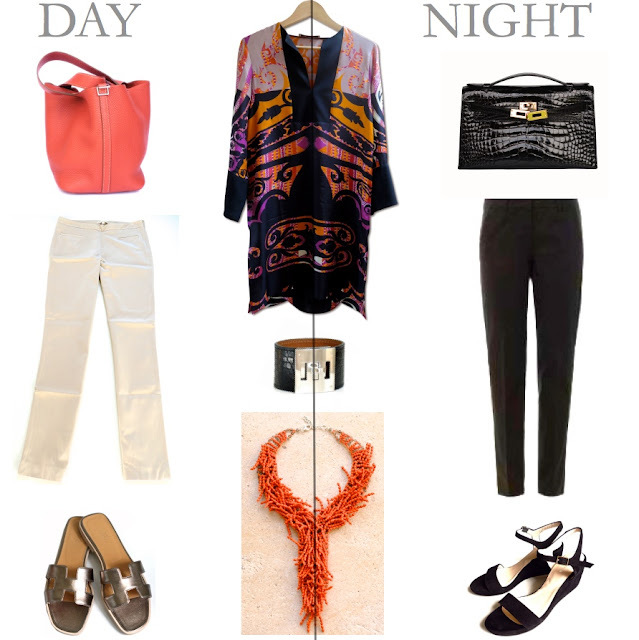 I love how easily it adapts to a variety of occasions, and from day to night. 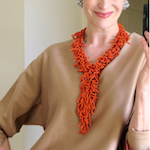 For a daytime look I paired it with a casual Picotin in sanguine and added a MaiTai Collection howlite statement necklace in orange for a little bit of extra summer chic. For an evening look, the bag gets replaced by a pochette, and the ecru trousers by a black pair. While assembling the pictures for this post, I looked at Cannes photos from previous years and found one from 25 years ago, taken on the Corniche above Cannes en route to my 28th birthday celebration lunch. 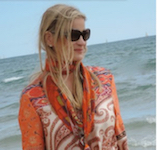 Back then I loved wearing sunglasses, accessories and scarves as much as I do today. Only that my jewelry was mainly gold, and I wore mostly dresses and heels! Au revoir beautiful Cannes, until next time! They would have to shake me off of that island at dusk because I would not want to leave! It is oh so beautiful there. What a wonderful way to celebrate your special day! 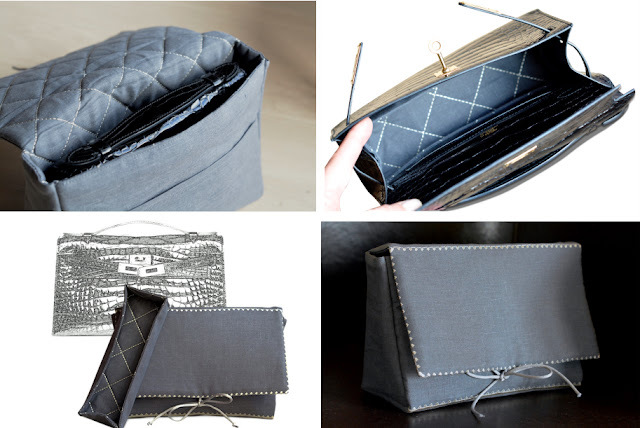 Congrats to you on your fab pochette! Love the liner and case,too! Dearest MT, Re: The 25 yr. old photo...You're a dead ringer for Grace Kelly! More, more! I'm certain we'd all live to see more of the evolution of your style. Please dig up more photos!! Missing all here, and hope to be able to add my "two cents" more often. Bisou, Bisou! So lovely to see you, dearest haverfordgal, you very missed! Thank you also for the sweet compliments. Bon Dimanche! P.S. When will the Long Gemstone Gris Necklace be available again? OMG you're a ringer for Grace Kelly in that old photo. Is that an MG? I love this post, everything looks so idyllic and luxurious. Perfect for a Swans getaway. Whoever doesn't have a DH already will surely find romance in such a place (she said, wistfully). Thanks once again for letting us share in your trip. Oh BTW, you described the coral flower tree so lyrically, dear Jerrine must look to her "best writer" crown! Your picture in the sport cart with glasses and scarf reminds mine..... Time goes so quick! I did not remember haviing seen your H black croq pocket ? Is it new? Anyway your are still and for evee a splendid woman. Dearest MaiTai, I am a real petrol head and seeing an AC Cobra always makes my heart beat a little faster! You must have made an incredibly chic and stylish entrance to your party - Wow! Yes!!! The Cobra is a Star! Wonder if MT held onto that beauty? What other accessory does a girl need, when you've got that gorgeous car? Yes! All one needs is a hamper filled with some bubbly! Fifi, the only other accessory I can think of is a gorgeous man, and of course MT has one of those, too! Bubbly is always a good idea, as well. Happy you enjoyed the pic, many thanks, dear Jo! The car belonged to my then BF. Bubbly is still flowing though! Well, yesterday afternoon's comment seems to have been gobbled up and is floating around somewhere in cyberspace, but, I simply echoed everyone else's sentiments regarding the Grace K. twin. That picture looked like it was taken right out of "To Catch a Thief!" And, yes, I'd love to see a picture of you outside of that chic little sports car, too. I'm just betting that we probably wouldn't be able to tell the difference between then and now, though. Congratulations on the very lux and luscious KP. The new case and liner set is inspired. Makes me want to go out and buy a KP! Thank you for a most wonderful visit to Cannes. I'm so looking forward to our next trip, wherever that may be. Thank you, dearest Angela! Can't believe it's been that long either. Re yesterday, I wish! As usual I have written wrong. I wanted to say : you were, you are, and will be for ever a BEAUTIFUL lady! You are so sweet and kind, thank you! When I earlier today took a break from work and checked FB, I couldn't believe my eyes and had to look a couple of times extra. What was Grace Kelly doing there? You, my friend, look just like her driving the along the coast towards Monte Carlo. I know I won't, Katja. Those days have long passed me by, but there is hope for you! Thank you for sharing the memory as well as the new adventures, which are georgeous as well. I love your views of the world very much! Liebe Claudia, well spotted! Wish we would have met each other then. So happy you enjoy the travelogues, hopefully there will be one about Düsseldorf one day.. Alles Liebe und einen schönen Sonntag! Mai Tai...as you know, I a long-time admirer and Hermes aficionado, but the Kelly-look in the roadster leaves me breathless. Do a reprise, please!! Hello dear John, long time no see! Happy you liked the pic, many thanks for stopping by! so much is already said from all this wonderful ladies, but I have to say thank you as well. Thank you for sharing this post and all this fabulous photos with us. And specially the pic from you in the roadster is really breathtaking. I also thought its Grace Kelly in the film with Cary Grant in „über den Dächern von Nizza“. But its you! How pretty and elegant you are. This pic could also be current taken while your journey to Cannes. great if you still have this car. I love oldtimer like this one. And your new purse "Kelly Pochette" is divine. I fall in love with this purse - never saw this Kelly before. Dear Gabriele, oh how I wish too I still had the car, but it wasn't even mine in the first place! So happy you like the picture and the Kelly Pochette, she's my precious little one <3 Now that she's had her debut I will definitely show her more often. Thanks so much for the lovely comment and compliments, and have a most beautiful Sunday. Liebe Grüsse! Just curious about your career path before you became a mother and a wife, i.e. what line of work you were in, and also, did you continue to work after becoming a mother? It's so difficult these days to balance the two! I worked as a producer in advertising before our son was born, and then became a full time mum. I started to blog and develop my collection once he started school, and now I am busier than ever before! Love the day to night idea!! Thank you. 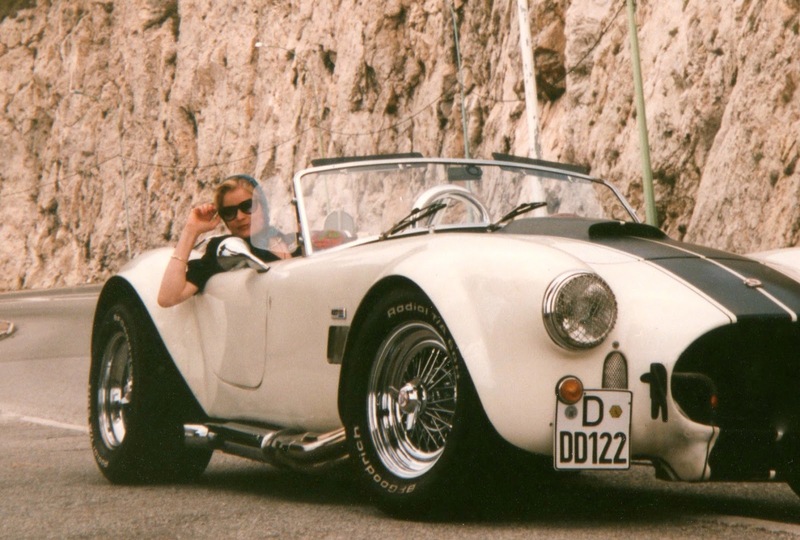 :-) What a fantastic picture of you in that lovely Cobra a couple of years ago, dear MaiTai! You know what a passion I have for vintage cars. 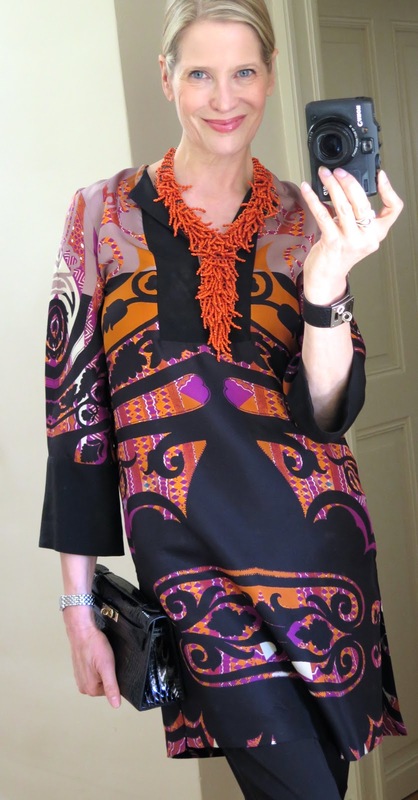 I'm also a big fan of your black, orange and violet tunic - is it still available? Thanks for all the holiday memories - makes me want to pack my bags straight away. Thanks so much for the lovely comment, dear HappyFace! 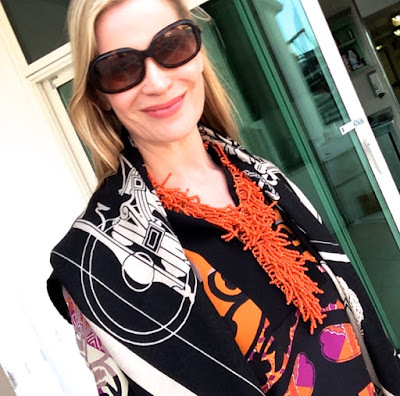 The tunic is from a couple of years ago by Etro (2014). Hope you can track one down, wishing you the best of luck! Cannes feels a long time ago now, looking at the pics again makes me want to pack my bags too.. Have a happy Sunday! Beautiful! 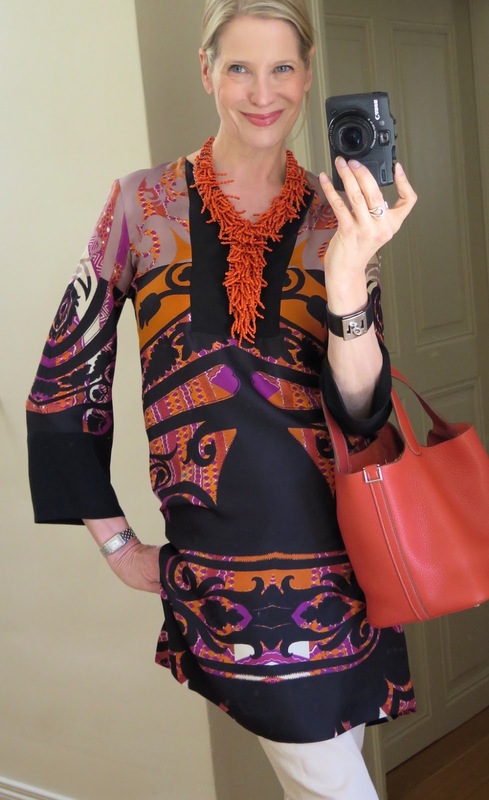 The gorgeous tunic with that amazing necklace. Perfection! I wish I could carry off such a look but alas I am not tall enough! You look so chic. Many thanks for the kind compliments, dear Nest Girl. I love tunics, they are so great for summer. You can find them in so many different lenghts and shapes.. hope you come across a perfect one!